This is the message I preached on Sunday, February 24 at St. Timothy Lutheran Church. The Gospel was Luke 6:27-38. There’s nothing easy about today’s gospel lesson. You may feel like, “You’ve got to be kidding, Jesus!” These hard words are not meant for the crowds, but for Jesus’ disciples, for those who are committed to hearing even when they cannot fully understand what Jesus means. Throughout the centuries, people have tried to water down these words of Jesus. Some would say that enemies can only be loved if people try harder. Others would try to spiritualize this passage, coming up with a more spiritualized interpretation of what it means to love an enemy. However, no matter how we may explain this passage from Luke’s gospel, nothing will reduce its demand. 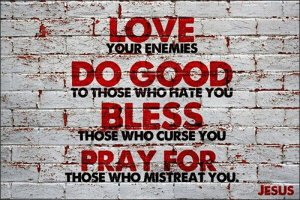 Right out of the gate, Jesus lays down his expectations of discipleship: love your enemies, do good to those who hate you, bless those who curse you, pray for those who abuse you. The love Jesus speaks of is not so much a noun, a characteristic or an emotional state as it is an action. This love is not romantic love, liking or even friendship. What it does mean is a whole-hearted, unreserved, unconditional desire for the well-being of the other. It may be impossible to feel love for an enemy, but it is not impossible to act in certain ways, even toward our greatest opponents. Jesus has laid down the general principle that his followers do not reciprocate evil with evil, nor draw their behavior from those who would victimize them. Now, of course, the question comes, who is our enemy? There was quite a discussion on Facebook concerning this, begun by a pastor in Rochester. She very specifically asked the definition of enemy. The answers were varied and many. For Jesus’ disciples and the Christians of the early church, enemies were those who persecuted and ostracized them for their faith in Jesus. How would the Christian community respond to those who persecuted them for Christ’s sake? The response is our gospel reading for today. At least that’s how they should respond. Who do we consider enemies? Do we think we personally don’t have any? Do we go to the level of our government’s enemies? Maybe we think of those trying to cross our southern border with Mexico as enemies. Are enemies anyone who might infringe upon our way of life? Maybe our enemies are those who take the presence of our military away from home to a foreign country. While living in Palestine, one of the first questions we’d be asked by Palestinian Arabs was our feeling toward the Jewish people. Things were seen in a very black and white manner. If you loved the Jewish people, then you hated the Arab people and if you loved the Arab people, you hated the Jewish people. One of them had to be the enemy. Particularly as Christians, believing in God’s love for all, this was a very difficult issue. Did we ever resolve it? Not really. However, over time we proved our love for the Arab people by living out Christ’s love. What Jesus means by the love of enemies is clearly spelled out in the three verbal demands that follow and flesh out the initial demand. The three demands are do good, bless and pray. That all sounds good, but it seems a little ethereal, doesn’t it? So, Jesus gives us concrete examples of what he means: a disciple struck on the cheek, one’s coat being taken and beggars. No one who takes away possessions should be asked to return them. Here Jesus teaches on how not to be a victim. In other words, take charge of your life and the situation by taking the initiative in loving, caring and giving. That is certainly counter-cultural and seems to go against all we’re used to in our lives. At the time of Jesus, soldiers or masters were the ones who would strike one on the cheek. It was the way a master disciplined a slave or servant, asserting his authority, putting the slave back in line. To stand there offering your left cheek as well, actually became an act of resistance. Unable to exercise discipline in the accepted manner, all can see the master’s powerlessness, which shames and dishonors him. Similarly, not just anyone would take away one’s coat. This would typically be a soldier, with the taking being extortion. The coat refers to the outer garment worn in Jesus’ time. Giving away the shirt or inner garment would leave one standing naked. This would be embarrassing, but it is the injustice that is really being exposed. Giving the shirt as well as the coat demonstrates the injustice of having the coat taken in the first place. These examples demonstrate how to love enemies. There are powerful, non-violent ways to expose injustice. We have seen such in the lives of Mahatma Gandhi, Martin Luther King, Jr. and Desmond Tutu as well as unknown others who have fought for justice in a non-violent way. Jesus calls us to extend the generous give and take normally reserved for immediate family and close friends to everyone. We often see needy people in Jamestown: homeless people, those with mental health or addiction issues. We may see them as beggars. Whether or not we give any money, we can always be kind to such people, giving them the gift of love. One missionary in Brazil always stopped when encountering a beggar. She would ask the person’s name, lay hands on him or her and pray. It is so much easier to avert our eyes from these people. Jesus has demonstrated for us what non-retaliation and generosity look like, vv. 27-30, culminating the series of demands in the Golden rule, which summarizes it all, v. 31. The Golden Rule was very familiar to Jesus’ audience. Versions of it were well-known in many cultures. Seneca’s version was about waiting to get what you deserve. Jesus put a positive twist on it however, that would help explain how to go about the difficult task of loving one’s enemy. Rather than describing what is, Jesus’ version describes what should be. He basically forces us to try on the shoes of the other person, not letting us off the hook. His words about how to treat the most difficult people turn us into the very people who may well be someone else’s enemies. Jesus makes no promises that these actions will convert the enemy into a friend, will modify the enemy’s behavior or even alter one’s own feelings toward that enemy. But in the way we look at another, an enemy who is loved can no longer be an enemy. Next, Jesus repeats the principle of the first paragraph. The difference is that here it is applied in relation to those who treat us well, potential or actual benefactors. In Jesus’ day, one’s social status and one’s economic circumstances hung on what was owed to others and what one was owed by others. However, according to Jesus’ way, just as one’s behavior is not determined by how one is treated by an enemy, neither is it determined by the friend or benefactor. Jesus explores the established alternative behavior of loving only those who love in return. Sinners aren’t necessarily those who do awful things but are simply those who are outside the Christian community. If outsiders can act equitably, then Jesus’ disciples should hold themselves to a higher standard. Christian behavior and attitude should be prompted by the God we worship, who does not respond in hate to hatred or respond with love to love. God does not react but acts in love and grace to all and this is the way of children of the Most High. All the behavior expected of us is rooted in the character of God. Ultimately, we become what we worship. We worship a generous and merciful God who pours out blessings on good and bad and we can reflect that in our lives. We too become generous and merciful. great reward, we become children of the Most High. To be God’s children is to relate to others as God relates to us, meaning that our behavior is not a ploy to outmaneuver our enemies, but finally, the reason is that God is a God of mercy. We learn this pursuit of life from God, who is kind to even the ungrateful and selfish (v. 35). Two principles of Jesus are stumbling blocks for most of us. The first is the rejection of privilege based on wealth and the second is the rejection of the retaliation that spawns violence. These ideas are diametrically opposed to the assumptions of the marketplace and media that shape so much of American culture. In our world, the wealthy are privileged and conflict requires that we show strength through retaliation. Look at all the wars being fought in our world. Look at our heroes. They are rarely poor nor non-violent. What is the result? Power and materialism and the quest for possessions have increased dramatically as well as violence in homes, schools and streets being rampant. How many times have you seen or listened to the news and hear of yet again, another killing? The kingdom Jesus preached and lived was all about glorious, uproarious and absurd generosity. Think of the best thing you can do for the worst person and go ahead and do it. Think of what you’d like someone to do for you and do it for them. Think of people to whom you’re tempted to be nasty and lavish generosity on them instead. What a difference this would make in our lives, families, workplaces, churches and nations. This life of following Jesus is all about new life bursting out, like flowers growing through concrete, startling us all with color and vigor. Jesus has not given us a new rule book, a list of dos and don’ts, but the point is to impart and illustrate an attitude of heart, a lightness of spirit in the face of all that the world can throw at us. We are being shown a new future, including new ways of interacting with the world and a new way of being. But the thing is, how do we live this way? Ultimately, we can’t. Just as we “cannot believe in Jesus Christ [our] Lord or come to him” by “[our] own understanding or strength,” (Martin Luther, Small Catechism). Just as we cannot have faith without the Holy Spirit, we cannot live the life God calls us to without the work of the Holy Spirit in our lives on a daily basis. We cannot, but God can and does work through us. That’s a promise! That promise means we can do all that God expects of us, which will turn this world on its ear. We can treat others as we would like to be treated. There can be more than enough love, attention, food, worth, honor, and time to go around. The world that has us trapped in the death and loss that is part and parcel of it is not the only one there is. God’s promise of love changes everything. And when Jesus comes along saying that the greatest command of all is to love God and to love our neighbor, he too is asking us to pay attention. If we are to love God, we must first stop, look, and listen for him in what is happening around us and inside us. If we are to love our neighbors, before doing anything else we must see our neighbors. With our imagination as well as our eyes, that is to say like artists, we must see not just their faces but the life behind and within their faces. Here it is love that is the frame we see them in. Now may the God of love, fill us to overflowing with the power of the Holy Spirit, that we may be the love God is calling us to for friend and enemy alike.